I worked at Moriah Primary School and my husband Jack packed shelves at Franklins in Edgecliff, Sydney. Jack worked for Goodwill Products for 26 years. 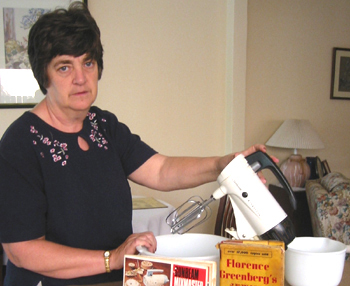 I’ve always said that when my old Sunbeam Mixmaster stops working I’m going to stop baking. I bought it a few years after Jack and I married in 1966. It looks just like the ones on sale in the stores today except it’s not a fancy colour. The big bowl is still the original but I’ve replaced the smaller bowl. It has this great selector for different kinds of whipping and juicing and a speed dial. 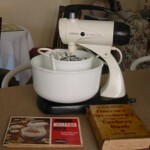 My mother-in-law kept telling me I needed a Mixmaster. I thought it unnecessary because my mum had never baked or cooked much. My mother-in-law kept telling me I needed a Mixmaster. I thought it unnecessary because my mum had never baked or cooked much. But when I eventually decided to purchase it, I realised my mother-in-law was right; I did a lot of baking when the children were small and it’s certainly been well used. However Jack and I are both trying to lose weight now so baking is not as frequent as it used to be. 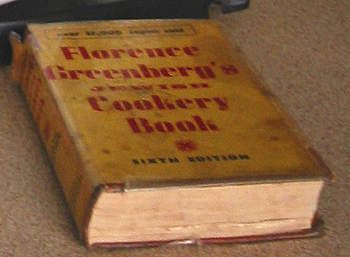 I received the Florence Greenberg ‘Jewish Cookery Book’ as an engagement present from an elderly aunt and thought it a rather dreadful object that I would never use. 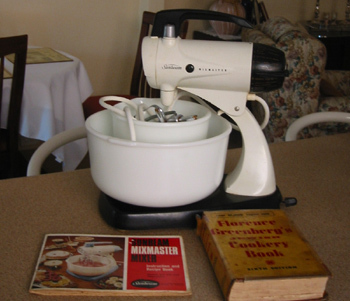 However, it is one of the few engagement presents that have come this entire journey with us and here, on the third page, is the advertisement for my exact same Sunbeam Mixmaster. 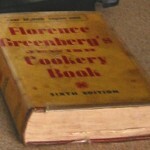 I tend to use this book for cooking for Jewish festivals. The Passover1 section is pretty stained and includes details about setting the Seder2 table. It has the best charoseth3 recipe. My mother literally walked across Russia with her mother in order to escape and come to England. Sunderland is on the banks of the river Wear in the north east of England; the land of the Geordies. I was born there in 1945, immediately after the war, one of the first “boomer” babies. As a child, I remember our big walk-in larder with the stone floor and the cream cheese hanging up in muslin bags. My mother literally walked across Russia with her mother in order to escape and come to England. My grandmother, Rachel, was one of very few women who actually had a university education; both a dentist from St Petersburg University and also with a rich Jewish education. 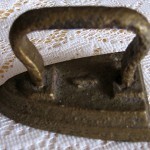 My grandfather was very active in the [Russian] revolution and died there while cleaning a gun. My mother, Genya, an only child, became Edna Bergson in England and was married at the age of 18. My family had an interesting attitude to religion. We were not religious but also did not eat pork or shellfish. My family had an interesting attitude to religion. We were not religious but also did not eat pork or shellfish. I was so embarrassed when, on a Shabbat (Sabbath) morning when no-one in the community was supposed to drive, my mother would drive past the shul (synagogue) and wave to everybody and they would wave back to her. People would say to me, “don’t worry. At least your mother isn’t pretending to be religious”. I think that that attitude has helped me through life. I never hid my religion and have always been upfront about being Jewish. Interestingly, I have never been involved in any sort of anti-Semitic incident. I started dating Jack when I was 17 and still at school. As soon as I completed education college, we married and settled in Sunderland because in those days both sets of parents would’ve expected us to do that. We should’ve moved away immediately but I was bonded to the education authorities for at least a year. I went into teaching primary [school students] and Jack was a kosher butcher. At this time supermarkets were beginning in England and Jack found he couldn’t compete with them. He decided to sell the business but couldn’t find a position with sufficient pay. We made the decision to move away from everyone, especially Jack’s family who were highly protective of him, and decided to take this opportunity to make a new start outside of Sunderland. We wanted to go as far away as possible; Australia was perfect because if you go any further you start coming back again! 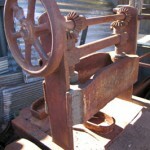 Jack had two elderly aunts living in Sydney and as a qualified kosher butcher, it was easy to obtain the visas. We decided to burn our bridges in Sunderland and bought one-way tickets to Sydney. Sunderland was a very strong community and our leaving was considered disruptive. Sunderland was a very strong community and our leaving was considered disruptive. In time many of Jack’s family also migrated to Australia and I always joke that I came all these thousands of kilometres to escape them and they all followed! But the remaining community in Sunderland blame us and say that because we moved and were followed en masse, the Jewish community has really fallen apart. Once there were two synagogues, a mikva4 built by my paternal grandfather, a kolel5 and a yeshiva6 and now there is nothing. They have all closed. Jack has the program from the F.A. 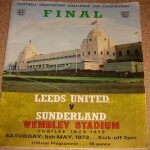 Cup Final between Leeds United and Sunderland in 1973, the year before we left. He remembers the day like it was yesterday. 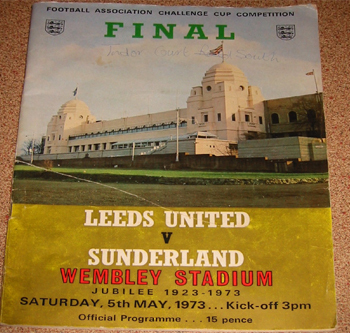 It was pouring with rain and the second time Sunderland had ever won the final. The first time was back in 1937. Soon after that game, an old soothsayer said Sunderland would only do it again when the figures were reversed. She was right – 1937 to 1973. We flew to Singapore [from London] with our children aged six and three years, and came to Australia on a ship called the Patris. The ship was absolutely full because unbeknown to us, it was the last ship that sailed to Australia with people who weren’t required to have a visa or definite job. We had the cheapest, most dreadful internal cabin and the air conditioning wasn’t working. We had the cheapest, most dreadful internal cabin and the air conditioning wasn’t working. I went up to the bursar and told him we could not sleep there, and showed him the brochure that promised air-conditioning. He said there were no extra cabins and therefore no choice. I said, “that’s fine, but we’ll just take our blankets and sleep upstairs in the lounge room”. When he refused permission I said, “you try and stop me!”. They eventually found two cabins for us by moving the band out of their cabins. We found ourselves in very nice front cabins with a porthole. I felt insistent because we’d paid a lot of money out of the little we had. 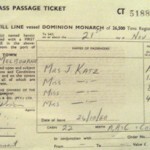 We sailed into Sydney on the Queen’s Birthday public holiday in June 1974. It wasn’t sunny and it wasn’t sparkling. Jack’s cousin met us. He took us to Bondi Beach; it was grey and miserable and the waves were lashing. I remember thinking, “oh well, it’s not much better than Seaburn, our local beach back in England”. On arrival we first stayed at Jack’s aunt’s place in Rose Bay and then rented a two bedroom flat there for about three or four months. Within a week of arriving Jack was stacking shelves at Franklins in Edgecliff. They paid him about $90 a week and we thought it was a huge amount of money. After about six weeks he had had enough and his uncle in Melbourne worked for a firm who sold promotional advertising and suggested he have a word with their Sydney manager. Jack was interviewed by a Londoner and they talked football over the entire interview without asking what experience he had. Jack was given the job and worked for Goodwill Products for the next 26 years. It was only after we bought our first apartment, in Bondi, six months after we arrived, that we knew we’d made the right decision. There was no turning back. There were no luxuries but we were managing to live quite comfortably and had a nice group of friends. I began as a primary teacher at Moriah [a Jewish day school in Queens Park, Sydney] and stayed at the same school my entire working life. Sunderland, which was one of the founding members of the English football league, has been in existence since the late 1800s, and was relegated from the Premier Division this year (2006). Jack still follows the team and believes they’ll come good again eventually. 1. Passover is the Jewish equivalent to Christian Easter. It celebrates the freeing of the Jewish slaves leaving Egypt. 2. The Seder is the name given to the festive meal held at Passover. 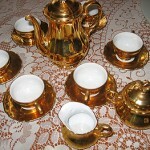 It includes symbolic herbs and unleavened products. 3. Charoseth is a mixture of wine, grated apple and nuts. It symbolises the mortar used to build bricks in the temporary dwellings of the freed Jews in the desert. 4. Mikva is a ritual bath. 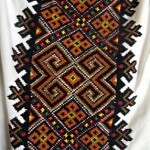 It’s used before festivals and by women after menstruation. It’s also used to ‘kosher’ utensils. 5. The kolel is a place to study to become a rabbi. 6. The yeshiva is a Jewish rabbinic academy of higher learning.